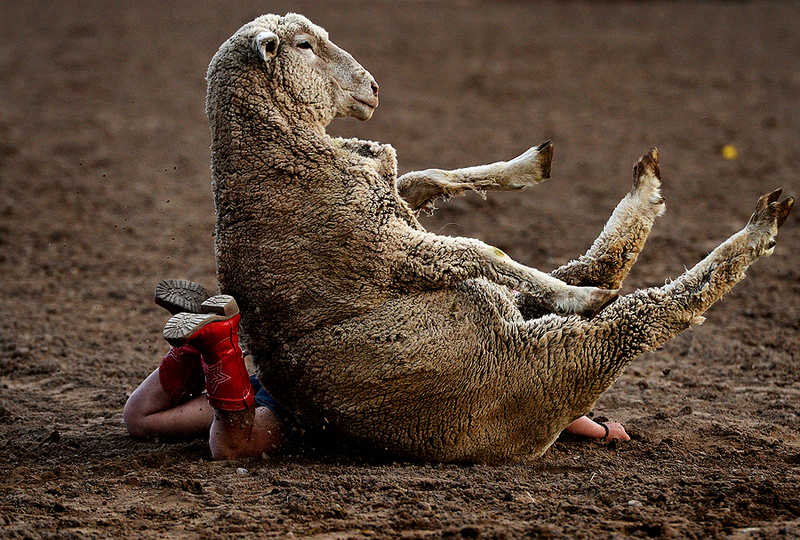 "Sadie Bezzant is crushed by a sheep in the mutton busting competition during the Strawberry Days Rodeo on June 19, 2013 in Pleasant Grove, Utah. Mutton busting is a form of rodeo for youth that introduces them riding events they're currently too young, small to compete in." Photography has a lot of cliches and it's probably safe to say cowboy hats are one of them. Like most other photographers, especially those on the east coast of the United States, I find the hat graphically appealing. So obviously I am drawn to photographing others wearing them. However, that's not what makes me curious about rodeos. Having briefly lived in Utah, it was the first place I ever witnessed the culture. I was instantly drawn to the sport that perseveres the western way of life and the working cowboy, even though competitive rodeos are practiced worldwide. I was recently out west and managed to swing by the 2013 Strawberry Days PRCA Rodeo in Pleasant Grove, Utah - which is the longest continually running rodeo in the Beehive State. In front of more than 7,000 fans, the rodeo happens every night for roughly a week. While I would have loved to document every night, I only had about two hours to roam to make some pictures for fun. From kids riding sheep in a mutton busting competition, to behind the scenes in the chutes with cowboys preparing to bare-back ride horses and bulls, I was in a state of pure visual joy. My curiosity behind the camera that night helps introduce others to this way of life that I find incredibly fascinating. This is certainly a sport, culture I would love to explore more. A few hours in the chutes and arena makes me want to spend more time documenting these cowboys, fans and way of life in the near future. "Designated hitter Chris Davis #19 of the Baltimore Orioles is mobbed by teammates after hitting the game-winning RBI against the Boston Red Sox in the 13th-inning at Oriole Park at Camden Yards on June 13, 2013 in Baltimore, Maryland. 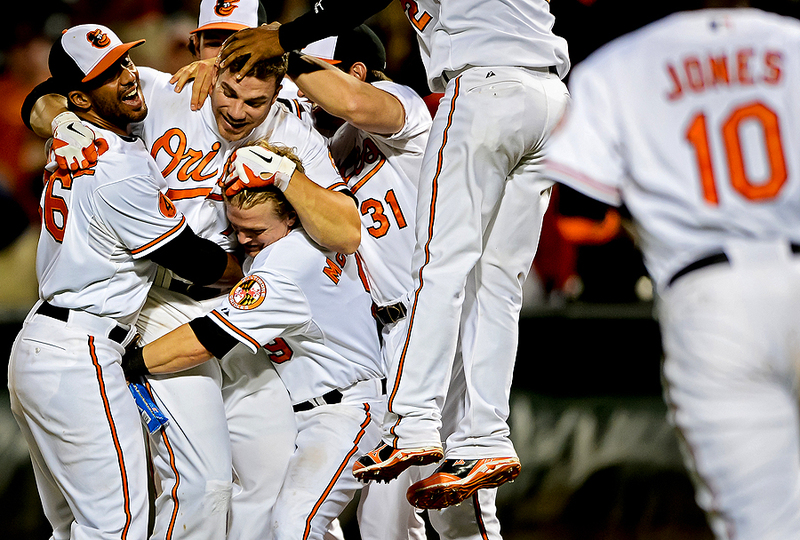 The Baltimore Orioles won, 5-4." 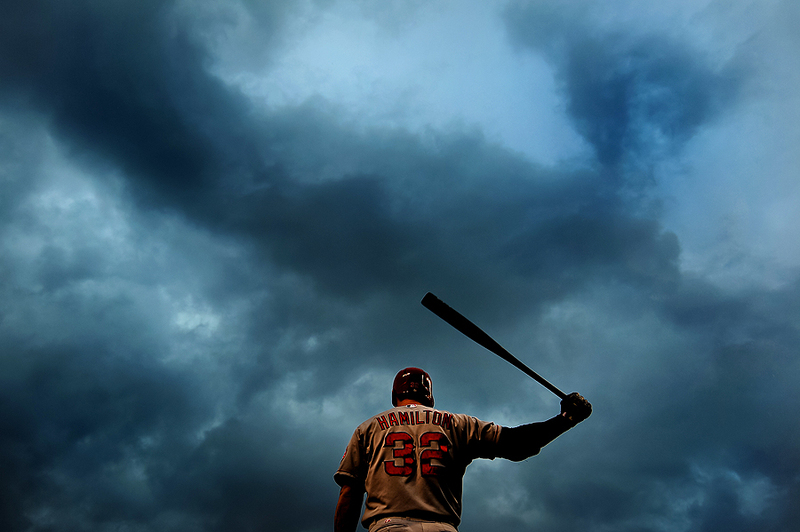 Baseball is very much a game of emotion. A lot of the time it's subtle - brief moments of joy or dejection that, in a blink of an eye, can totally be missed if documenting the game. A point to the fans after a thrilling catch, a wipe of the face after allowing a home run, or confidence being displayed ever so briefly after a big hit. Yet when games are close, and play goes into extra innings, everyone knows that all it takes is one big play to end the game. When this play comes, usually in the form of hit and walk-off, players cannot contain their emotions, much like the Baltimore Orioles displayed after Chris Davis hit an RBI single that brought home the winning run in the 13th inning against the Boston Red Sox. I was able to get a couple frames of this joyous scene before it was completely blocked by players of both teams and television cameras. I hope this image makes one feel the Orioles' excitement after game of good pitching that didn't allow any runs until the 13th inning. 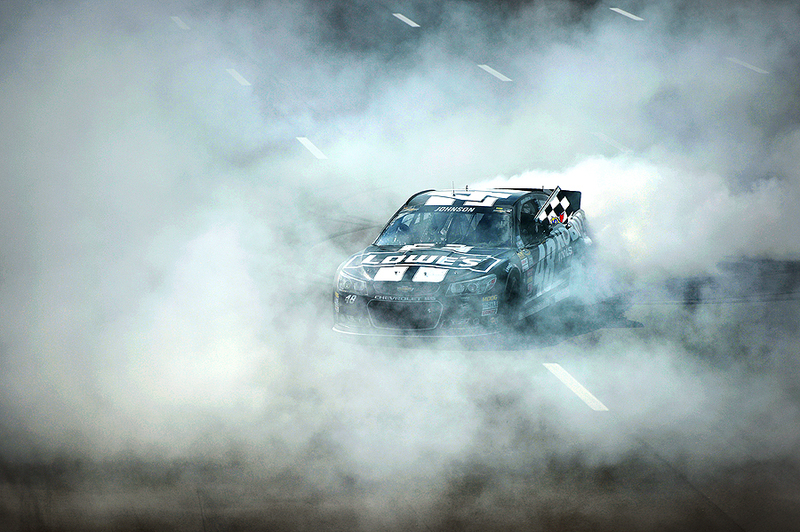 "Jimmie Johnson, driver of the #48 Lowe's/Kobalt Tools Chevrolet, celebrates with a burnout after winning the NASCAR Sprint Cup Series Party in the Poconos 400 at Pocono Raceway on June 9, 2013 in Long Pond, Pennsylvania." Back on the grid, I recently traveled to document the NASCAR Sprint Cup Series Party in the Poconos 400 in Long Pond, Pennsylvania. As always, teamed up with Getty Images to photograph the race action, as we braved the weather until Sunday for the big race. It's been unseasonably cold this NASCAR season and leading up to the Party in the Poconos 400 wasn't any different. Bundled up in jackets and attempting to stay dry from the rain seemed to be the main concern. But as the day started on Sunday, we were given a great, sunny day to shoot the race. I had the opportunity to shoot the start and finish from the flag-stand which is always a lot of fun. Having a pack of machines speed underneath you is surreal. A relatively clean race, at the end of the 160 laps, Jimmie Johnson, driver of the #48 Lowe's/Kobalt Tools Chevrolet, took home the checkered flag. "U.S. Army soldiers carry the flag-draped transfer case containing the remains of U.S. Army Spc. Robert A. Pierce during a dignified transfer at Dover Air Force Base, on June 6, 2013 in Dover, Delaware. According to reports, Pierce, who was from Panama, Okla., assigned to the 1st Battalion, 506th Infantry Regiment, 4th Brigade Combat Team, 101st Airborne Division, in Fort Campbell, Ky., was killed by a suicide vehicle-borne improvised explosive device while supporting Operation Enduring Freedom - Afghanistan." Last week I was back at Dover Air Force Base covering a pair of dignified transfers. While these transfers are an incredible honor to document, it's not an assignment I think any photographers look forward to. Documenting a dark day in anyone's life is never fun for a photojournalist, but it's important that we do so. It usually isn't until I am driving up the highway that I reflect on what I had the honor to document. 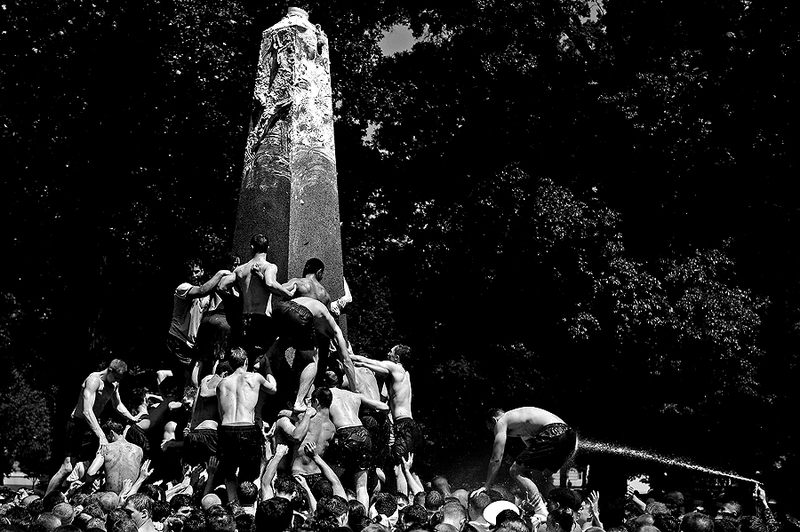 The opportunity to photograph fallen heroes will never fall by the wayside. During this trip to Dover, as I always do, I asked the public relations team what type of aircraft the fallen will be transferred from. This allows me to properly prepare on what type of gear to bring out onto the runway. 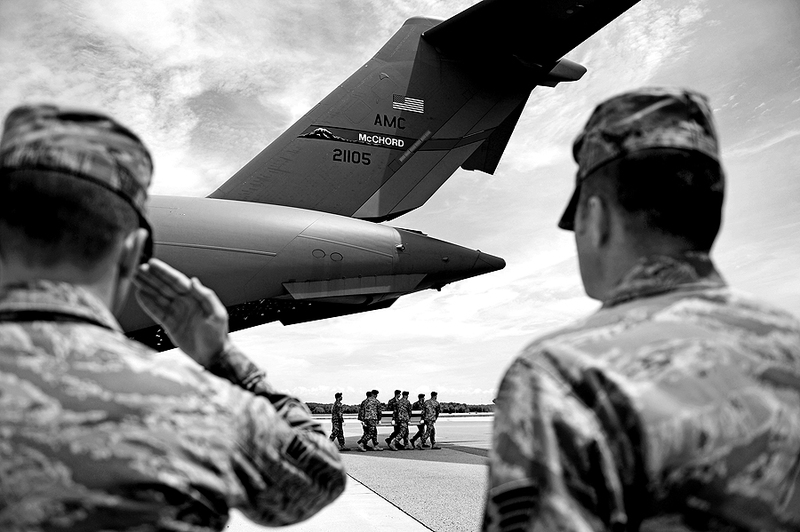 As in the past, the aircraft was a rear-loading Boeing C-17. Familiar with the procedure, I decided to stick more to my wide angle in an attempt to document the dignified transfer as if someone were standing their witnessing it themselves. That resulted in the layered moment above which I think brings a sense of place to the assignment. As always, thank you to the families for allowing the media to cover a somber day, so that others in the world can understand what is happening in conflict zones. 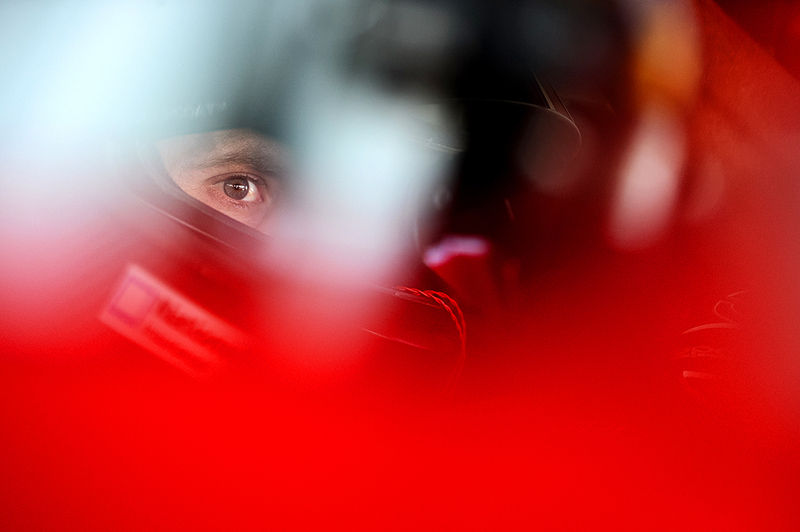 "Regan Smith, driver of the #7 Taxslayer.com Chevrolet, sits in his car during practice for the NASCAR Nationwide Series 5-hour ENERGY 200 at Dover International Speedway on May 31, 2013 in Dover, Delaware." The motorsport of turning left is no different from any other sport - come from behind upsets were made to happen. A couple weeks ago, I had the opportunity to document three days of action packed NASCAR racing nearby at Dover International Speedway. The days were long and hot - I love summer - but tons of fun. I had a blast working hard to photograph the various events and races that happen on a typical weekend at the race track. On Sunday's big race, a pair of leaders battled back and forth for a majority of the race. But with just a handful of laps left, everything changed, and Tony Stewart came from behind to take the checkered flag. My positions all weekend allowed me to document not only race action, but a bit of celebrations, too. A good weekend of racing and looking forward to more races as the season reaches about halfway. 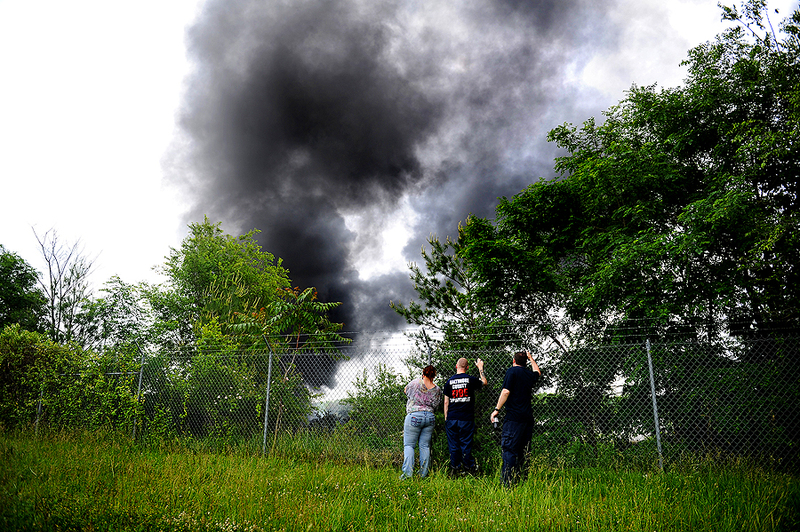 "As smoke fills the sky, passerby try to get a better look of a train derailment that caused a major explosion in the Rosedale neighborhood on May 28, 2013 in Baltimore, Maryland." As a freelancer, I often find myself traveling to local spot news events even if I am not assigned to actually document the happening. Most of the time, I'm either called enroute or when on the scene shooting. If neither of those happen, I try to secure an source for my images quickly afterward. Recently a train derailed on the border of Baltimore County and Baltimore City in Maryland, not far from my house. So I grabbed my gear and went looking for images that best told the story with no outlet for my images at the time. Initial reports said that the chemicals burning were toxic, which caused road closures, traffic and slight panic. After making an image from a distance, I ended up parking nearly a mile away and walking close to the scene. Not actually working at the time, I decided to travel extremely light - no computer, no long glass, no media credentials, and only carry one body with a wide angle lens. Being on foot, I was able to get almost everywhere I wanted to go. Not once was I hassled, other than when I tried to get close when reports were stating dangerous toxins were burning. Working only a wide angle lens, it forced me to rely on the basic kit I had and use my sense of the surroundings to find images that best told the story visually. While I did get some images of fire crews fighting the blaze and of the train derailed from a vantage not far from the above image, it was this image I liked the best. These passerby's curiosity, the same thing that led me to where they were standing, kept drawing me back to the image as most in the area could only see the billowing smoke. As they marveled at the wreckage below, it said it all in a non-literal sense. In the end, my editors at Getty Images called and my pictures were distributed to help tell the story in Baltimore that day.